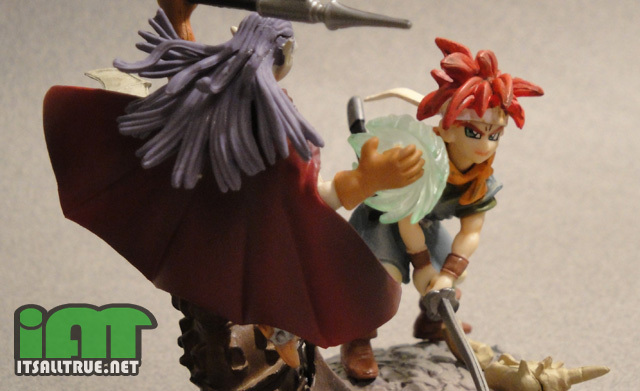 In 1995, Squaresoft released Chrono Trigger on the Super Nintendo, and the video gaming world was forever changed. 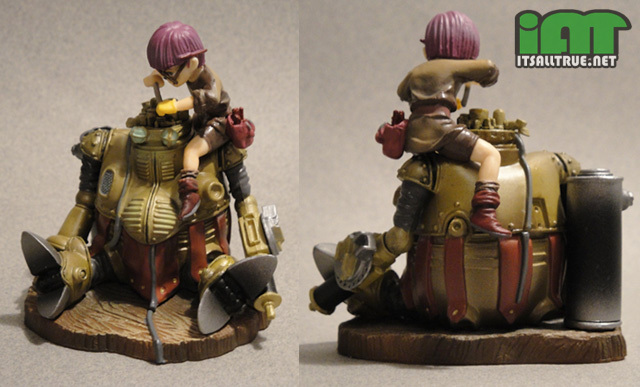 Now, fifteen years later, Square Enix has released a set of figures based on this timeless game. The first thing that popped into my mind when I saw them: Finally! Chrono Trigger isn’t just a game, not anymore. It’s a symbol of RPG perfection with a cult like following. Chrono Trigger fans are almost their own religion. Constantly praying to the video game gods for just one more sequel, while eagerly devouring dead-end rumors about the series continuing, or buying up re-releases on different systems, and even going so far as to program their own remakes and sequels. You may think this sounds a little excessive, but you have to keep in mind that Chrono Trigger is one of the greatest games ever made, and I’m not exaggerating. It’s the perfect blend of story, action, game mechanics, art, and music. It was the first game to offer multiple endings based on actions and decisions you made while playing out the story line. It allowed you to play with seven different characters that you could switch out at your leisure. Plus, each of those characters had sub quests that not only could affect the outcome of the game, but also that character’s personal story. This might all sound quaint today, but in 1995 there were no games that even came close to this amount of detail. So, fifteen years and two re-releases later, Square Enix has finally produced the first figures of these classic characters. Sure, they made some tiny versions of these characters as cell phone straps back in the day, but that hardly counts. I’m talking real figures, or statues, or busts, or anything that a modern day collector can display on a shelf with pride. These little trading figures fit the bill. 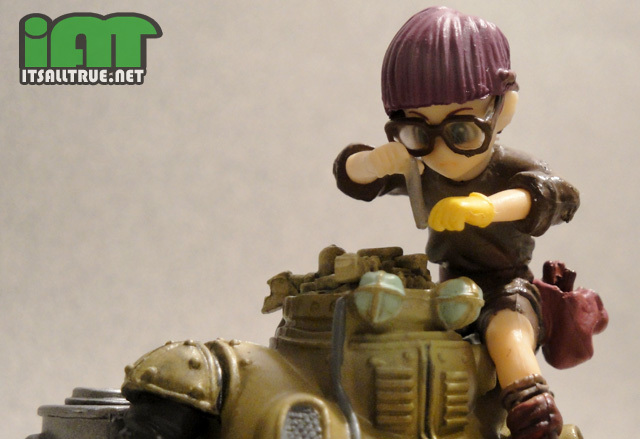 In Japan, these figures are being released as blind box trading figures. You don’t know what you’ll be getting till you open it, but if you buy a case of six, you should get all five figures with one double. This is different from the U.S. release. Outside Japan they are being sold as a box set. The bad thing is that the solicitation implies that the box set only includes four figures, leaving out one of the more important ones: Crono and Marle. If this is true, then it’s a huge mistake on Square Enix’s part. We won’t know for sure until September, when the set is due out. Those of you who are familiar with the series will recognize that each vignette has been taken from the promotional material from the game. Each one is about three inches tall and depicts a small portion of a larger scene. Every scene is accurately depicted in the style of the games art director, Akira Toriyama, the creator of Dragon Ball Z franchise. Lucca and Robo. Robo rests patiently in Lucca’s workshop as she sits upon his shoulder, tinkering with the mess of components that make up his brain. This is the simplest of the scenes, but I think it’s my favorite. Not only did the complexities of Robo’s brain get sculpted, but there are a lot of nice details like Lucca’s pouch full of tools. I also like that large canister behind Robo, which is actually a giant batter, complete with plus sign. I didn’t realize that until putting this set together. You also get a nice sculpt on Robo, which is much more up close and detailed than the other figure of him. 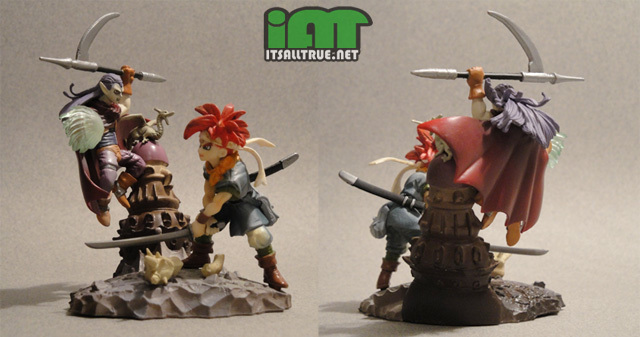 Interestingly, this is the only set without Crono. Crono and Magus. This is my least favorite vignette in the series, which is sad because Magus is my favorite character. For some reason the top of his hair is a separate piece that was glued on. They did this to create more flowing detail in his hair, but it mostly just creates an ugly line through his forehead. Also, there is a perspective problem with this scene. Magus’ cape is going behind his fortress. This makes the gigantic castle look more like a totem than the background for this setting. I would have really liked to have a different scene all together, but Magus doesn’t appear in any other drawn scene. 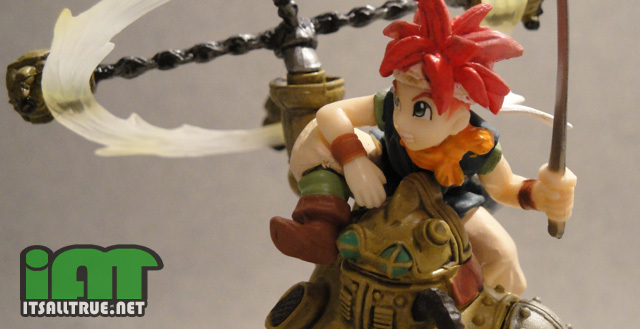 There’s still some nice details with this set, like the bones beneath Crono and the little dragon that sits on top the tower. Continue to Page Two…. This looks like the set I saw at Jungle Anime in Little Tokyo Downtown LA. I think the set I saw was a sample set though and it was awesome! My brother and one of our friends, who are huge Chrono fans, were drooling over this set. I have a feeling they’ll pick it up! If they’re big fans, I’m sure they’ll love it. I know I do.